A Web-Based Tool for Improving the Quality, Effectiveness and Efficiency of Patient Care. 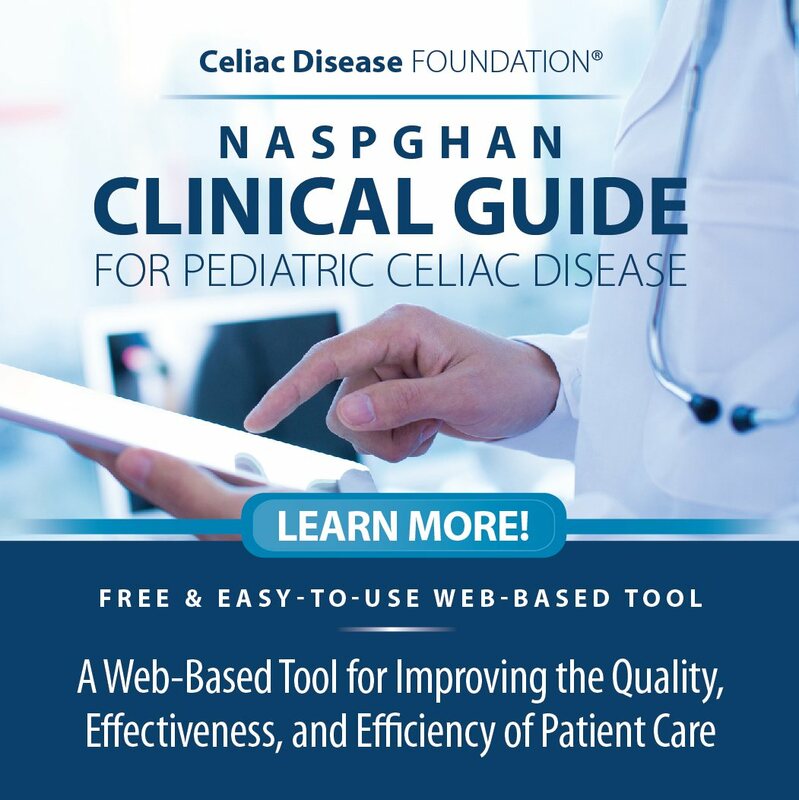 Celiac Disease Foundation®, in partnership with the North American Society for Pediatric Gastroenterology, Hepatology and Nutrition (NASPGHAN), is pleased to present the NASPGHAN Clinical Guide for Pediatric Celiac Disease. This easy-to-use and convenient FREE web-based tool will assist healthcare professionals in the diagnosis and management of celiac disease patients, improving the quality and effectiveness of care provided. By viewing and/or using this Site or the Guide, you are agreeing to be bound by all of the terms and conditions explained below. Celiac Disease Foundation has partnered with the North American Society for Pediatric Gastroenterology, Hepatology and Nutrition (NASPGHAN) to make evidence-based clinical practice guidelines, related summaries, and companion materials widely available to health care professionals. The Guide and some of the related materials on this Site are the products of named organizations that are solely responsible for their content. The informational offerings presented on this Site are intended primarily for the following audiences: * Physicians, nurses, and other health care professionals and provider organizations * Health plans, health systems, health care organizations, hospitals, and integrated health care delivery systems * Medical specialty and professional societies * Researchers * Federal, State, and local government health care policymakers and specialists If you are a patient and are accessing this Site, you should understand that the information presented is intended and designed for the use of the expert audiences previously identified. You should seek assistance from a health care professional in interpreting these materials and applying them in individual cases. This End-User License Agreement ("License Agreement") is an agreement between you and Celiac Disease Foundation ("CDF") for access to and use of the Clinical Guide for Pediatric Celiac Disease ("Guide") provided to you on the CDF website (together with its related sites, discussion forums, and other services, the "Site"). ### 1. Grant of Limited License. Subject to the terms and conditions of this License Agreement, CDF hereby grants to you a non-transferable, non-exclusive, limited, personal license to access and view the Guide provided on the Site. ### 2. Intellectual Property Rights. You acknowledge that CDF and the North American Society for Pediatric Gastroenterology, Hepatology and Nutrition (NASPGHAN) are the owners of all right, title and interest in and to the Guide including, without limitation, all modifications, updates and other derivative works thereof and all copyright and other intellectual property rights related thereto. Except for the limited rights expressly set forth in this License Agreement, you hereby agree that you shall not at any time dispute, challenge, or contest, directly or indirectly, CDF's or the NASPGHAN'S right, title and interest in and to the Guide, or assist or aid others to do so. ### 3. Restrictions on Use; Accounts; User-Submitted Content. #### A) General You may view the Guide contained on the Site solely for your own personal purposes. You may not copy, transfer, reproduce, modify or create derivative works of any part of the Guide for any reason and may not use the Guide for any commercial purpose. You may not obtain or attempt to mine any information from the Site through any means not intentionally made available by us through the Site. You may not reverse engineer, decompile or disassemble any software located on or in the Site. #### B) Not Medical Advice The Guide is based on guidelines and data current at the time of publication, and must be used alongside review of more current published data. As patient circumstances differ from case to case, the Guide must not be used as a replacement for clinical assessment, and should be used cautiously as they may not be appropriate for all individual cases. The Guide is intended for educational use only and will be reviewed and updated every 2-3 years. It is not intended for individual use by patients or parents and should not be used in place of seeking professional medical advice, diagnosis or treatment by licensed practitioners. CDF makes no representations or warranties and explicitly disclaims the appropriateness or applicability of the Guide to any specific patient's care or treatment. #### C) Clinical Use Clinicians may use the Guide to support diagnosis and treatment of their celiac disease patients. At all times and for all purposes, the Guide may only be used in the context of clinicians exercising independent medical or professional judgment within the scope of their professional license. No one, including clinicians, may use the Guide for any commercial purpose and may not claim, represent, or imply that any Guide content that has been modified in any manner is derived from, based on, related to or arises out of the Guide. #### D) Review of Use Upon CDF's request, you shall provide CDF with examples of each use you have made of the Guide under this License Agreement. You agree to immediately cease any such use on receipt of notice from CDF that such use is in violation of this License Agreement. #### E) Accounts and Security Use of certain portions of the Site may require you to create a valid account ("Account") and may be subject to different or additional terms depending on the service. You are responsible for maintaining the confidentiality of your Account and the activity that happens on or through your Account. CDF reserves the right at all times (but will not have an obligation) to terminate your Account or otherwise suspend or terminate your access to the Site. You have the right to cancel your Account at any time. You can cancel your Account by following the procedures made available through the Site. By creating an Account, you represent that you are at least 18 years of age and that the information you provide in connection with the creation of your Account is accurate. #### F) User Submitted Content You may be permitted to upload or submit content to the Site in various forms (collectively, "User Content"). By providing any User Content, you agree that it will not: (i) infringe any copyright, trademark, patent, trade secret, or other proprietary right of any party; (ii) be profane, obscene, indecent or violate any law or regulation; (iii) defame, abuse, harass, threaten or otherwise violate the legal rights (such as rights of privacy and publicity) of others; (iv) misrepresent your licensure, credentials or professional status; (v) incite discrimination, hate or violence towards one person or a group because of their belonging to a race, a religion or a nation; or (vi) restrict or inhibit any other user from using the Site. By uploading or submitting User Content to the Site, you give CDF a non-exclusive, royalty-free, world-wide, perpetual, transferable license to use, store, reproduce, adapt, distribute and publicly display such User Content in any and all media or distribution methods (now known or later developed). You acknowledge that by providing the ability to view and distribute your User Content on the Site, CDF is merely acting as a passive conduit for such distribution and is not undertaking any obligation or liability related thereto. However, CDF reserves the right to review User Content and take any action CDF deems necessary as to such User Content, including but not limited to editing or removing your User Content and/or suspending or terminating your access to the Site based on your violation of the rules specified here. CDF also reserves the right to preserve access or disclose any User Content as we may believe necessary to satisfy any applicable law, regulation, legal process or governmental request, enforce this License Agreement, address fraud, security or technical issues, respond to user support requests, or protect the rights, property or safety of CDF, its users and the public. ### 4. Restrictions; Disclaimers; Limitation of Damages. #### A) General The Guide is a statement of consensus of the authors regarding their views of currently accepted approaches to celiac disease diagnosis and treatment. #### B) Updates The Guide is updated at CDF's discretion to reflect updates and changes by the authors. CDF will make reasonable efforts to post updated versions of the Guide on the Site, provided that CDF and NASPGHAN have no obligation to advise you of any updates nor does CDF and NASPGHAN have any obligation to update the Guide at any time for any reason. #### C) No Representations or Warranties CDF makes no representations or warranties and explicitly disclaims the appropriateness or applicability of the Guide to any specific patient's care or treatment. Any clinician seeking to treat a patient using the Guide is expected to use independent medical judgment in the context of individual and clinical circumstances of a specific patient's care or treatment. #### D) WARRANTY DISCLAIMER CDF AND NASPGHAN MAKE NO WARRANTIES CONCERNING THE SITE OR THE GUIDE, WHICH ARE PROVIDED "AS IS" AND "AS AVAILABLE". TO THE MAXIMUM EXTENT PERMITTED BY APPLICABLE LAW, CDF AND NASPGHAN DISCLAIM ALL WARRANTIES, EXPRESS OR IMPLIED INCLUDING, WITHOUT LIMITATION, THE IMPLIED WARRANTIES OF MERCHANTABILITY, FITNESS FOR A PARTICULAR PURPOSE OR NON-INFRINGEMENT. CDF AND NASPGHAN DO NOT WARRANT THE ACCURACY, CURRENCY, APPROPRIATENESS, APPLICABILITY OR COMPLETENESS OF THE GUIDE, OR MAKE ANY REPRESENTATION REGARDING THE USE OR THE RESULTS OF THE USE OF THE GUIDE IN TREATMENT. #### E) LIABILITY LIMITATION YOUR USE OF THE SITE AND THE GUIDE IS AT YOUR OWN RISK. TO THE EXTENT NOT PROHIBITED BY APPLICABLE LAW, IN NO EVENT SHALL CDF AND ITS EMPLOYEES OR NASPGHAN AND NASPGHAN MEMBERS BE LIABLE FOR ANY DAMAGES OF ANY KIND INCLUDING DIRECT, INCIDENTAL, INDIRECT, SPECIAL, PUNITIVE OR CONSEQUENTIAL DAMAGES ARISING OUT OF OR IN CONNECTION WITH THE LICENSE GRANTED UNDER THIS AGREEMENT OR USE OF THE SITE OR THE GUIDE, INCLUDING, WITHOUT LIMITATION, LOSS OF LIFE, PHYSICAL INJURY, PROPERTY DAMAGE, LOSS OF DATA, LOSS OF INCOME OR PROFIT, OR ANY OTHER DAMAGES, LOSSES OR CLAIMS, EVEN IF CDF AND ITS EMPLOYEES OR NASPGHAN AND NASPGHAN MEMBERS HAVE BEEN ADVISED OF THE POSSIBILITY OF SUCH DAMAGES, LOSSES OR CLAIMS. #### F) INDEMNIFICATION You agree to indemnify and hold harmless CDF and NASPGHAN, their affiliates, and their respective members, employees, officers, directors and agents (collectively, the "Indemnified Parties") from any liabilities, costs, claims, demands, or damages, including reasonable attorneys' fees, asserted by any third party due to or arising out of: (i) any breach by you of this License Agreement; (ii) your use or access of the Site or the Guide; (iii) any User Content; or (iv) any activity related to your Account by you or any other person accessing the Site using your Account. ### 5. Trademarks. You recognize that all trademarks and service marks associated with the Guide ("Marks") are owned by CDF. CDF retains all goodwill and intellectual property rights in such Marks. You shall not use the Marks or any confusingly similar Marks for any commercial purpose, including, without limitation, for purposes of marketing or promoting your services, without the prior written approval of CDF, which approval may be withheld in CDF's sole discretion. Each approved use of the Marks shall require the independent written approval of CDF. ### 6. Notices. You shall not remove any copyright, trademark or other notices or legends contained on the Guide and all copies of the Guide must contain, at a minimum, the following notice: ©NASPGHAN Clinical Guide for Pediatric Celiac Disease 2017. All Rights Reserved. ## 8. Modification of License Agreement. CDF reserves the right to change the terms of this License Agreement at any time. Updated versions of this Agreement will appear on this Site. Continued use of any updated version of the Guide after any such changes constitutes your agreement to be bound by such changes. ### 9. Remedies for Violation. CDF reserves the right to seek all remedies available at law and in equity for violations of this License Agreement, including but not limited to the right to block access to the Site and the Guide. ### 10. General. You agree that this License Agreement contains the entire agreement between CDF and you relating to its subject matter. If any provision of this Agreement is held to be invalid or unenforceable, the validity and enforceability of the remaining provisions shall not be affected thereby. This Agreement will be governed by and construed in accordance with the laws of California without giving any effect to the conflict of law provisions thereof, and each party agrees to submit to personal jurisdiction in the federal and state courts of California and waives any objection to venues in said courts. This Agreement will not be governed by the United Nations Convention on Contracts for the International Sale of Goods, the application of which is expressly excluded. **The Site may not be accessed from Cuba, Iran, North Korea, Sudan, Syria or any other country to which the United States has embargoed goods. ** You agree that the Guide will not be shipped, transferred or exported into any country or used in any manner prohibited by the United States Export Administration Act, or any other export laws, regulations or restrictions. IF YOU OR YOUR ORGANIZATION WOULD LIKE TO USE, COPY, ENDORSE AND/OR DISTRIBUTE THE GUIDE FOR ANY PURPOSE, OR IF YOU OR YOUR ORGANIZATION ARE INTERESTED IN LICENSING THE GUIDE AND/OR IF YOU HAVE ANY QUESTIONS REGARDING PERMISSION TO USE THE GUIDE, PLEASE CONTACT JULIA MCBETH, DIRECTOR OF RESEARCH AND ADVOCACY AT [JULIA.MCBETH@CELIAC.ORG](mailto:julia.mcbeth@celiac.org). 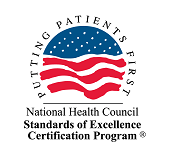 The North American Society for Pediatric Gastroenterology, Hepatology, and Nutrition (NASPGHAN) acknowledges content contributions to the Site provided by: The NASPGHAN Clinical Care and Quality Committee, including Norelle Reilly (content author), KT Park (committee chair), Binita Kamath (NASPGHAN councilor), Ashish Chogle, Kristin Fiorino, Iona Monteiro and Edward Hoffenberg; the NASPGHAN Technology Committee, including John Pohl (committee chair), James Bayrer, Daniel Mallon, Douglas Mogul, and Neha Santucci; and the following individuals for providing additional contributions and editorial oversight: Ivor Hill, Stefano Guandalini, Edwin Liu, Ritu Verma, Joseph Levy, Alessio Fasano, and Edward Hoffenberg. NASPGHAN would also like to gratefully recognize Marilyn Geller and the Celiac Disease Foundation for their generous funding contributions and for producing the Site. National Healthcare Practitioner Directory Join our directory of healthcare professionals who treat patients with celiac disease. Waiting Room – Order Brochures Order celiac disease brochures for your office. Glutenostics Help your patients monitor inadvertent gluten exposure using this at-home test kit. Current Celiac Disease Clinical Trials & Studies Recommend current clinical trials and studies to your patients. iCureCeliac® Patient Registry Encourage your patients to join iCureCeliac®.